But when, in the early 1809s, Blackpool Corporation was experimenting with an electric tramway service along the Promenade to cope with the hordes of visitors, Fleetwood watched with careful interest, for they were anxious to encourage Blackpool’s visitors to come to Fleetwood and for Fleetwood’s visitors to be able to go to Blackpool quickly and easily. The usual method of travel between the two towns for visitors was by means of horse-drawn landaus which were slow and costly, prohibiting the trip to all but the well-to-do. A cheaper method was by train, but that was still fairly expensive, being 9d (5p) each way and the trains were not all that frequent, or easy to get at. From the start Blackpool had trouble with their tramway system, and Fleetwood was canny enough to keep a watching brief while Blackpool struggled to solve their problems, the main one being how to find a fool-proof way of getting the electricity to the trams. For aesthetic reasons people did not want overhead cables. Electricity, gas and water went underground, they said, not overhead. What if someone caught their umbrella in the wires overhead and were electrocuted? Well, unless they were caught by a very high wind and blown up in the air, that did seem a little unlikely, but to those who hated overhead wires any probability was a good excuse. So initially the supply came from conduits in the centre of the tracks in the road, but being on the coast and subject to high winds, the conduits were forever filling with sand and were useless. There were many other problems as well and reluctantly Blackpool abandoned the conduit system, going back to horse-drawn trams until they could decide on something better. Fleetwood, however, saw nothing wrong with the overhead cable system, pooh-poohing the idea of people being electrocuted this way, and in 1897 the Blackpool and Fleetwood Tramway Company was formed. (Despite its name it had nothing at all to do with the Blackpool Corporation tramway service.) In July that year 400 navvies moved into the town to start laying the tracks down the centre of West Street and East Street, but as it was the middle of the season there was virtually no accommodation for such a large crowd of workmen, and many of them were glad to sleep on the floor of apartment houses paying 4d or 6d a night for the privilege of doing so. Twelve months later at 2am in the morning of July 13th 1898 the residents who lived on West Street and East Street were wakened by what sounded like a herd of elephants squealing their way down the main street and, with mixed feelings (which some people still have), realised that the tramway had come to Fleetwood, for this was the trial run of the first tram. Later that day two tram loads of VIPs set off from Dickson Road in Blackpool for Fleetwood. The tram had to pass a protest demonstration from owners of horse-drawn landaus and other means of transport, but it arrived in Fleetwood amid the cheers of large crowds and afterwards the VIPs had a lunch in the newly opened Mount Hotel. The service was not universally welcomed, all the clergymen from the churched on West Street and East Street complained that the noise of the trams was drowning out their Sunday sermons. But short of shouting a bit louder there was not a great deal they could do about it, for the trams were here to stay. The coastal tram ride caught on immediately with both Blackpool and Fleetwood visitors, and became so popular that it worried not only the landau owners but also the railway company who took a poor view of this new opposition. 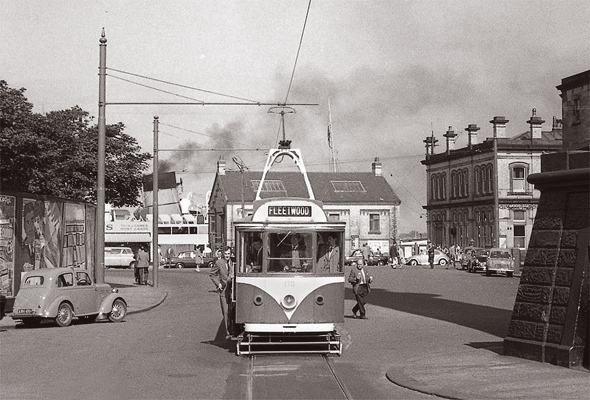 They reduced the train fare and increased the number of trains, so the tramway company retaliated by running express trams for a return fare of 10d (5p) and the great attraction of the 8 mile high speed tram ride along the coast – there were only three stops between Gynn and Fleetwood – was irresistible and the Fleetwood to Blackpool service became the most profitable tramway service in the country. Which probably did not please Blackpool at all as it merely took heir visitors out of the town and was of no benefit to the Blackpool amusement caterers or rate-payers. In Fleetwood the cables were carried by the ornamental arms of posts in the middle of the road and when Blackpool saw that they did, indeed, look quite attractive and were completely successful, they decided to ignore the critics and follow suit, altering all their tracks accordingly. (Isn’t it nice to know that sometimes Fleetwood leads the way even to Blackpool?!) At that time Blackpool were using young bots and youths as guards and drivers for their trams and were, unaccountably, losing money on the service. The youngsters were paid very low wages and – perish the thought – could they have been making up their own wages from the fares? – but the Fleetwood Tramway company employed men, paying them the then very high wage of 24s6d (£1.22 and a half new pence), with a vigilant ticket and inspection routine, thus ensuring that the company got the major part of the takings. Further along the cost Lytham, too, was trying its own tramway service using trams which were powered by gas but the power was not enough to get a fully loaded tram over the railway bridges along Lytham Road and for those occasions passengers had to get out and help to push the tram over the bridges! A practice not always appreciated by a well-dressed passenger! In 1899 there were plans to run a tram to Poulton from Blackpool and then on to Thornton and back to Cleveleys, a circular tour which would have certainly been popular, but like so many ambitious enterprises it never got off the ground, although another Grand Tour was actually started, however. For 2s7d (twelve and a half new pence) you could take a tram from Blackpool to Fleetwood, cross to Knott End by ferry boat, continue by road on a charabanc to Pilling, catch a train to Garstang and then by coach back to the starting point. Whether this journey took too long or was too expensive is not recorded, but I don’t think the idea survived very long. Now they are talking of reviving the service – well, nearly. It is thought that when the barrage across the Wyre is complete a tram will run from Fleetwood across the barrage to Knott End. Which may, or may not, please the Knott Enders. But when the barrage will be completed is another question again. In 1919 the Blackpool and Fleetwood Tramway Company decided to sell out, offering the service to Fleetwood Borough Council, who turned the offer down. Instead it was bought by Sir Lindsay Parkinson who sold it to Blackpool Corporation without making any personal profit, and from that date the Blackpool Corporation and the Blackpool and Fleetwood Tramway services were united. Later, in 1924, the trams were re-routed past Bold Street, and the Ferry office and on to Pharos Street, thus avoiding the need for the loop. This meant that the spot behind the Euston was no longer required, although it had a brief period of fame when, in 1969, it was the home for a couple of years of the famous Fisherman’s Friend tablets which were made there before moving to their present factory on Copse Road. Virtually all traces of the Blackpool and Fleetwood tramway service have now gone but fortunately the service continues and brings thousands of visitors each year to Fleetwood, benefiting the traders and the market, and there is an affectionate reminder of those early days in the annual and highly popular Tramway festival. When the Fleetwood Tramway service started, the first tram went down the main street at 6am in the morning (to the annoyance of the residents who lived above the shops), and the drivers on the early shift were usually up and about by five a.m. for they had to walk to the depot. These were the days before Yale locks, doors being locked with large mortice-type keys. One of the tram drivers who lived in Pharos Street was in the habit of calling for his friend, another driver who lived in Kent Street to find his friend on his knees on the pavement in front of his closed front door fiddling with a piece of wire under the door. Nothing daft about Fleetwood folk! Can you tell me where in the photo is The Lighthouse cafe – it was at 1a Pharos Street, Fleetwood. She in turn gave it to me. Any help appreciated – the building on the right of the Lighthouse looks to have been demolished ?? PS are there any photos of The Lighthouse Cafe around 1920-1924? ?